The perfect Apple Pie to feed a crowd. This Slab Apple Pie is easy, delicious, and made with fresh apples. Your guests are going to rave about this simple and delicious Original Apple Pie with a twist. I love this Slab Apple Pie because it can feed the masses, and it couldn’t be any easier to throw together. If you are feeling super domestic, you can make the pie crust from scratch (using this crust recipe) or the refrigerated pie crusts work great as well. This recipe is so easy, and the fresh apples taste amazing with the crispy pie crust and the sweet sauce. Thanksgiving and family meals can be difficult when you are limited on ovens. We recommend eating this warm out of the oven. You could even cook it while you eat. We wouldn’t recommend making this more than 48 hours in advance. You could prepare it then cook it when it comes time, but this won’t last long in the fridge. The crust won’t cook as well and the apples will get mushy and brown. This recipe was designed to feed a crowd, but you could easily half it and use a 9×13 inch pan rather than a 10×15 inch pan. 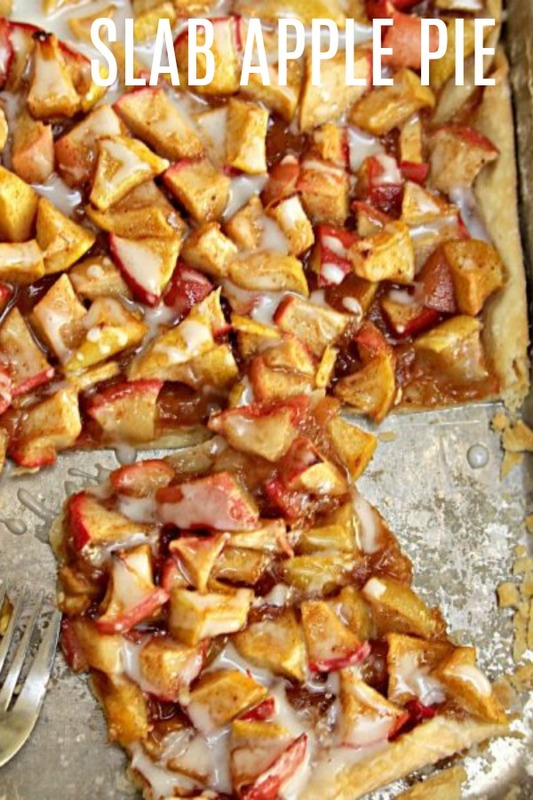 This recipe is pretty flexible when it comes to apple variety. You could use any type of apple. We recommend using Granny Smith Apples, or Gala Apples. I have also tried this recipe using Pink Lady Apples and it was delicious. You could also use apple pie filling, but we prefer the taste and texture of fresh apples. For this recipe, you may need a couple cans of apple pie filling. The pie crust might also be a little more soggy if you use apple pie filling, due to the extra sauce. Baking Pie crusts can be difficult. But we have found the secret to keep them from burning. All it is is a little tin foil. Simply place 1 inch wide strips on the crusts of your pies to keep them from burning. With only a few minutes remaining to bake, you can remove the foil. I would remove it with about 8-10 minutes left to bake. This year, we will be having Thanksgiving dinner at our mom and dad’s house. Between the 6 of us sisters, 6 spouses, and 16 grandkids, we eat a lot of food. We always divide up the food assignments and there is always so much food, but let’s be honest – there can never be enough dessert. This dessert is the perfect way to make a pie for a crowd! The sweet glaze drizzled on top is the perfect finish to this delicious recipe. Remove one of the pie crusts from it's packaging and place on a lightly floured surface. Using a rolling pin , roll pie crust into a rectangle shape, until it's about 8x11" (give or take a little). Gently lift the crust and place onto one half of a 15x10x1 baking pan , folding any extra crust around the edges of the pan under so that they are all even. Repeat with the second pie crust and place on the other half of the baking pan (you will have about a 1" overlap in the middle, but just press it down until it's flush with the rest). In a large bowl , mix together sugar, flour, cinnamon, nutmeg, allspice, salt, lemon juice and cornstarch. Fold in the apples and stir until they are all coated. Spoon the apples into the crust and bake for 30-35 minutes or until the filling is bubbly (just watch that your crust doesn't burn - you could line the edges of the crust with aluminum foil to keep it from burning). While the pie cools, mix together powdered sugar and milk in a small bowl . Carefully drizzle glaze over the top of the cooled pie and serve. I tried and my family loved it! Oh my, enjoy and treasure that time with all of you under one roof ! Make memories and take lots of pictures. I have six daughters One just sent me this site Tell me about you! Hi Dana! I'm Cyd, mother of the Six Sisters. You can learn more about the girls by going to our home page of our blog. Click on "About Us" then click on "Meet the Sisters". So fun to know you have six girls too! Would love to hear the ages of your six daughters!! Thanks for stopping by and have a great week! 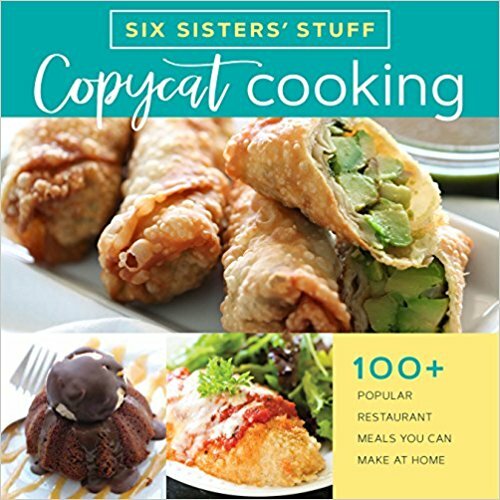 Hello, six sisters us one of my all time favorite recipes to follow, I use a great number of them! But, how about 6 boys, my husband is one of them, and my mother-in-law is a gem, 87 years old, but I remember when she cooked like she was cooking for a hay crew. Her recipes were from scratch & her boys never were hungry! Thank goodness for wonderful mama's of big families x 6! I can't imagine feeding 6 boys!! That would be sooooo much food!! My girls ate enough, but boys have big appetites! :) Have a Happy Thanksgiving! Tried this and LOVED it! Thanks for another great recipe! I wish I could give it more than 5 stars! This was the easiest pie I have ever made- and probably the most delicious!!! My family loved it! This recipe looks delicious. I'm wondering however, could you put a crust on top? Thanks. You would need to measure your pan. This recipe is for a 10 x 15 inch pan. If your pan is double this size, then double the recipe. It's good for a day or two after making. Good luck feeding the masses! !